Certificates for completing this video training program. GIVE YOUR EMPLOYEES THE RECOGNITION THEY HAVE EARNED! Recognition is vital for employees completing a training course. 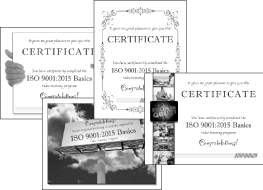 Here we offer a set of four certificates that you can use to complete the training process for viewers of our ISO 9001:2015 Basics video training program. Get them all and select the one that reflects the image of your company, insert the employees name onto the generic certificates (optional), and present it with appropriate fanfare. Your employees will take their training much more seriously and thank you for the recognition. This set of four certificates (or more) is available in three formats: PDF, JPEG and INDD (Adobe InDesign). Indicate above which format you would like. If you need a different format, let us know and we'll attempt to convert the forms accordingly. They will be sent to you by e-mail. Print as many certificates from these masters as you need for as long as you use our video. You will be sent all four designs (we may even add an extra one or two occasionally) and they are yours to use as you see fit.